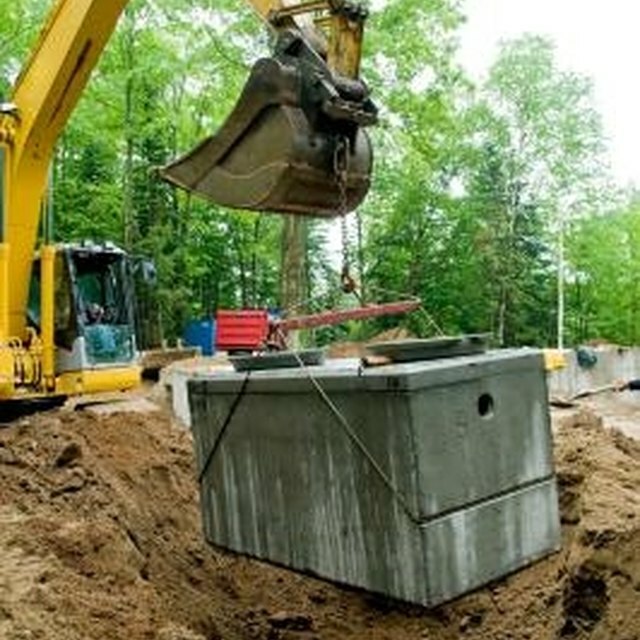 A septic tank is commonly used in rural areas where there is no connection to the main sewerage system and, according to the American Ground Water Trust, around a third of American homes are serviced by a septic tank. The tank will be buried somewhere near your home and the waste is delivered to it via a pipe leading from the house. If you have a septic tank, it is important to keep it clean and in good order because if your tank develops a serious problem, it can be expensive to fix. Your septic tank will be buried somewhere near your home. Unscrew the lid on top of the filter unit to expose the filter. Wearing the gloves and goggles, pull the filter out. Attach the hose to a faucet and hose down the filter until there is no waste left on it. Make sure that the water always is facing away from you as you do this. Replace the filter and screw down the lid. Contact your local authority to see if they can recommend a cleaning contractor, as some states insist that cleaners of septic tanks be licensed. Cleaning septic tanks is a specialized job and you should always use a reputable professional. You also can ask friends and neighbors for a recommendation. The contractor will back his truck as close as possible to your drain and insert a hose into your septic tank. The contents of the tank will then be pumped into the back of the enclosed truck. The contractor also may hose down the inside of the tank to remove any debris that may have become lodged, This water also will then be pumped out. Introduce a natural bacterial product such as BioGest to optimize the natural bacterial activity inside the tank. These bacteria break down the waste allowing liquid to rise to the top and "sludge" to form at the bottom. These bacteria balancing products come in sachets that can be introduced either directly into the septic tank or via the toilet, and will maintain the bacterial levels within the tank. Never flush away cat litter, sanitary products or anything else that could clog the system. Do not use anti bacterial cleaning products on a regular basis as these will interfere with the natural bacteria that are keeping your septic tank clean. Colette McCormick started writing in 2006 and has had work published in books, newspapers and magazines. She has recently written travel articles for "My Weekly," a leading weekly magazine in the U.K. McCormick was educated in Sheffield, England and gained A levels in economics and politics. How do I Seal a Grease Trap?